This book reveals the recent urban history of nine major Latin American cities – Mexico City, Havana, Santo Domingo, Caracas, Bogotá, São Paulo, Lima, Santiago, and Buenos Aires – through studies of their public spaces and the events that have taken place there. The case studies provide an unprecedented opportunity to look at cities with comparable cultural and political histories, and to investigate the use and meaning of urban space by ordinary people in extraordinary, history-making events. While some argue that public spaces are a prerequisite for the expression, representation and reinforcement of democracy, equally they can be said to be used in the pursuit of totalitarianism. In Latin America, there have been the experiences of the Santiago of Pinochet, the Buenos Aires of Videla, the Asuncion of Strossner, or the Caracas of Pérez Jiménez, among others. Yet even here political demonstrations in public spaces played a critical role in the eventual revocation of those regimes, and/or in the subsequent re-establishment of democracy. For the two opposing political visions – democracy versus totalitarianism – public streets and spaces, in both the past and present, have been the site for the enactment and contestation of various stances on democracy and citizenship. Indeed, the public sphere, as the intangible realm for the expression, reproduction, and/or recreation of a society’s culture and polity, usually encompasses opposing political visions and nurtures acute social confrontations which are played out in tangible space. 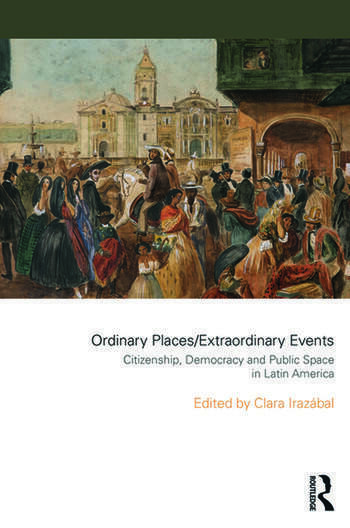 By exploring the use and meaning of public spaces in Latin American cities over time, the book sheds light on contemporary redefinitions of citizenship and democracy in the Americas, and by extrapolation, the world. Clara Irazábal is the Latin Lab Director and Assistant Professor of Urban Planning in the Graduate School of Architecture, Planning and Preservation at Columbia University, New York City.